Amy Powney, creative director at Mother of Pearl, is more than aware of the importance of sustainability. As a new-gen designer she is pioneering a movement within her sector for a move towards more ethical manufacturing processes. The sustainable line is launching firstly as a capsule collection in the hopes of doing the same for the main line in the near future. 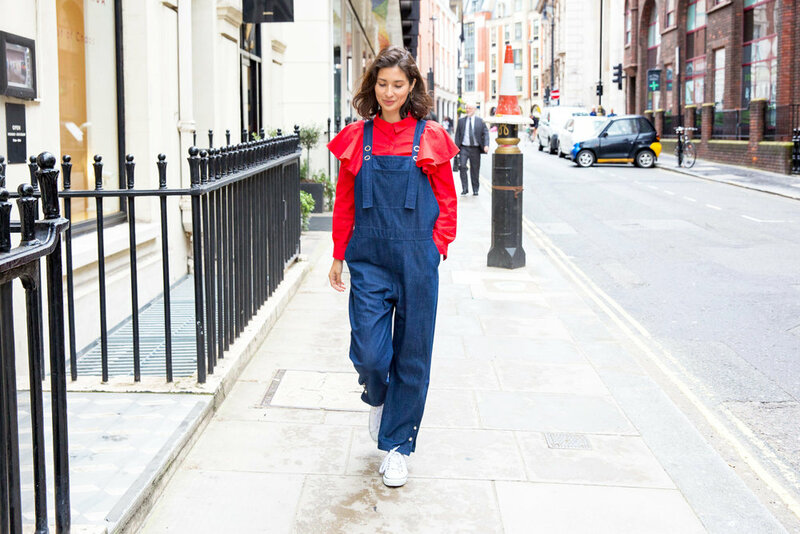 These dungarees are made from 100% organic cotton which is grown, woven, spun and manufactured in the same country to reduce its carbon footprint. The brand uses the only denim mill certified with the Swan Nordic Eco label. They have a filtration and treatment plant that cleans the water used in the manufacturing process and recycles it for other industrial uses. Heat and steam generated in the production process are captured and reused to minimise energy consumption. Denim garments are washed by a GOTS certified washing plant using approved chemicals for organic washes. The factory is also working to rehabilitate and integrate ex-prisoners. There is next to no mining involved in creating Lilian von Trapp jewellery. Instead, pieces are made from vintage diamonds and gold. This makes every piece sustainable and mostly free of the environmental and human rights effects associated with the mining of precious stones and metals. The brand's pouches are handmade in Italy from sustainably produced and recycled organic leather, silk and cotton and are included in every order. All additional packaging, labels and tags are produced from recycled or FSC certified paper. In addition to operating outside the traditional gold and diamond mining system, Lilian von Trapp donates two percent of the brand’s earnings to measures countering the long-term social and environmental effects on affected communities. For this, Lilian von Trapp supports the Earthbeat Foundation, an organisation devoted to providing education on the sustainable use of natural resources and enabling communities in developing countries to grow independently of exploitative industries. Ethletic created the first fairly manufactured soccer ball in the world, in Pakistan, a pioneering achievement in an industry that was extensively known for child labour and inhumane work conditions. Footballs are largely made from rubber and because until then no sustainability seal for rubber had existed, one of the brand’s founders, Martin Kunz, worked to create one. Thanks to his initiative, the natural rubber from Sri Lanka used by Ethletic was certified for sustainable forest management by the Forest Stewardship Council – a global first. In 2007, the idea to use the same rubber for trainers was born. In 2010, the Ethletic trainer became the first sneaker on the market to be certified with the Fairtrade quality seal for organic cotton. The brand is also dedicated to improving the living conditions of its workers in Pakistan. Ethletic donates 15% of the purchase price of its products to the workers’ welfare association at the production facilities. To this day, it is the sole responsibility of the women and men to decide which projects they want to use this money on, for instance for the education of their children, healthcare, pensions or for micro-loans.